Miscellaneous: Non-smoking rental, not adapted to children (stairs), no pets allowed. The property is in a beautiful location and the hosts Alain and Nathalie are lovely. The studio is very roomy, well equipped and private. I would recommend this accommodation wholeheartedly. You need a car, preferably a diesel that can cope with the hills in this area. Set your sat nav to arrive at the bottom of the road, otherwise it will try and take you down a rough footpath the other end. Though others have said that Eze is a relaxing ten minute walk away, this we found not to be so. The road is a cul de sac with a very poor and steep path at the end onto the road to Eze. Then requires walking on a road with very little footpath available. Take the car to Eze, it's safer. To see Eze at it's best, get there for 8 in the morning. Le Turbie is well worth a visit, Ville Franche is a sublime and the gardens of Mortolo are gorgeous. The headlands of Cap Martin and Cap D'ail are worth walking. Take binoculars to wonder at the luxurious boats meandering along the cost. All in all, highly recommended. We fell in love with Eze in 2011 and vowed to return. We weren't sure if we could find what we wanted at a reasonable price but we were very wrong. All my communications with Alaine prior to our arrival were so helpful and friendly. When we arrived we were thrilled to bits. The place is up a narrow road, approx 10 minute walk into Eze which is perfect of an evening. Natalie welcomed us and showed us around the apartment and was so helpful. Natalie and Alaine are right next door but they gracefully allow you complete privacy. We used the pool and adored the views out to sea. We ate on our private patio every day morning, noon and night. The accommodation was so homely but clean and comfortable. Natalie had made us a cake for our arrival which was delicious. The surrounding area is beautiful. Eze centre is walkable, it is a safe and beautiful little village with a few fantastic restaurants. It was heavenly to return to the apartment to relax and unwind, so peaceful and tranquil. The garden is filled with limes and beautiful flowers. Natalie and Alaine are lovely people, they helped us a few times with queries we had and their son helped translate - they also have us home made wine on departure - thank you so much for this. You are so close to nearby Nice, Monaco and the beach is a short drive down the hill. We loved sitting on the patio watching the cruise ships pass by and we felt privileged to have such a vantage point. If you want a clean, comfortable place with stunning views and excellent hospitality then do not hesitate to book this place. What a delightful find! An amazing place to stay in Eze village just a short drive away from the old town and the wonderful Le Jardin d’Eze. My wife and I stayed here last week and we wanted to add to the growing list below of five star reviews. Alain and Nathalie are gracious and friendly hosts, pampering us with fresh tomatoes and herbs from their garden, advice on the best beaches to visit, and a parting gift that we are still enjoying, allowing us to bring a part of the south of France back to New York with us. They both welcomed us as dear friends, and then left us to our own private paradise for the rest of our stay. The accommodations are spacious with views out to the Mediterranean. Azure skies merge with the green of the terraced garden creating a private jewel of an oasis that is perfect as a home base to explore the surrounding areas. Scents of jasmine, citrus, and the sea became the backdrop to our sunset dinners and the wall lizards that visit the patio during the day help keep the insects at bay. How can you have a bad day after breakfast on the patio followed by a quick swim in the pool? And it comes with the bonus of a washing machine to help lighten your packing needs. Nathalie ensures that cool water is waiting for new guests and the apartment is stocked well with travel maps and pamphlets on local attractions. If you’re looking for a great place to stay in this area of France, book the apartment, just not when we want to return! My wife and I had the most wonderful holiday here in Eze. A lovely surprisingly spacious apartment, bigger than the pictures lead to you believe. Everything was provided, loads of kitchen utensils, plenty towels, nice comfy bed a real little home from home. The terrace has breathtaking views over the blue sea both in daytime and at night, and luxury yacht and jet ski watching became a gentle pastime. The pool is just lovely, perfect for cooling down in the heat and you feel like you have joined the jet set with the setting. A car is certainly needed as the road up to the apartment is pretty steep, but with so many lovely locations only 15-20 mins away in the car Eze is really an excellent base to see the treasures of Roquebrune, Menton, Villefranche and Beaulieu and of course not forgetting the utterly charming Ezé village itself. The shop in Ezé sells almost anything you could need, although it is just large corner shop size. You can walk to Ezé village, it is a fairly steep (up and down) 20 mins and in the heat you would probably prefer to drive, but actually there are so many places to go to nearby that it would be a crime to stick to just Ezé itself. I have left the very best until last though. You may be concerned about staying in an apartment right next to the owners. DON'T BE. Alain and Nathalie are absolutely lovely and have clearly defined boundaries for their guests. They were very helpful when we arrived, sorted out my wi-fi issues (even though it was late in the evening and they were entertaining a guest), left us completely alone for most of the stay, the layout of the two terraces cleverly secluding one from the other at all times. We had a very private time, yet it was nice to know they were right there to help if necessary. We left with a lovely bottle of homemade Orange Wine (drinking it now), a jar of homemade Orange Jam and a bag of herbs from their garden to dry out for cooking. It kind of felt like we were staying with very discrete family! Don't be put off by the bargain price, just book it and enjoy some holiday bliss. We had our best ever holiday here. We only had 5 nights here and wish it could have been more. The owners Alain and Nathelie were very welcoming, they live next to the studio. 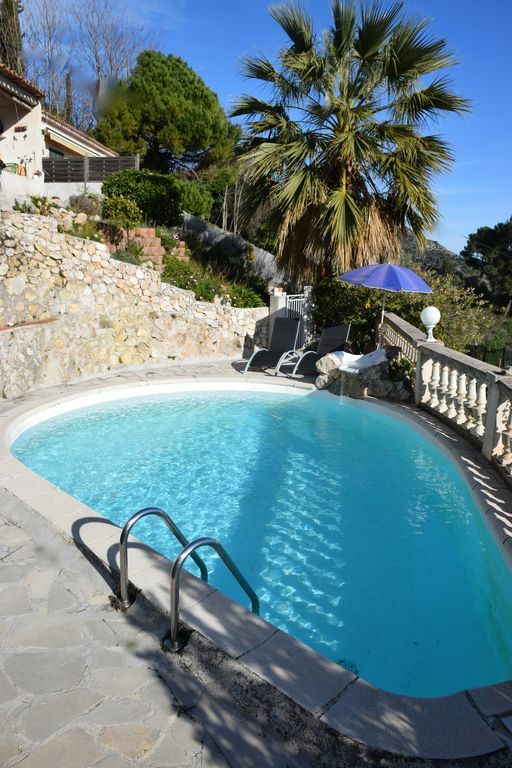 This studio is set on the mountainside 3km out of Eze village. A fantastic location with breath taking views of the Bay below. I would strongly recommend a car the studio is up a very steep hill (our rental car Fiat 500 had great difficulty getting up the gradient so something slightly bigger may be better). Not an easy walk up! There are no shops nearby and the walk to Eze in the heat would be difficult for those less than very fit.There is a small supermarket in Eze but a better one in Beulieu sur mer just another 2 km along the road. The pool was a welcome pleasure in the heat of the August heatwave. The pictures of the studio are accurate it is clean and comfortable, its the views that can't be caught on camera. We would definitely return to this peaceful Haven. Thank you Alain and Nathelie.